In an era of declining fuel prices, large body-on-frame sport utility vehicles are suddenly becoming popular again. The 2017 Infiniti QX80, a 7/8-passenger full-size luxury SUV similar to parent company Nissan’s slightly less upscale Armada, is Infiniti’s contribution to this segment. The largest vehicle in the premium Japanese automaker’s lineup, the QX80 is gaining traction with the well-heeled family. But the Armada outshines the QX80 for the upcoming year due to a comprehensive overhaul, while the Infiniti has seen no significant reworking since the 2011 model year, when it was still labeled the QX56. Based on Nissan’s terrain-busting Patrol, which is sold outside the U.S., the QX80 comes in 2 trims: the Base and the Limited. Offering 3 rows of seating that can handle up to 8 passengers, this big people-hauler is delivered with standard rear-wheel drive (RWD), while full-time 4-wheel drive (4WD) with low-range gearing is optional. Being primarily a luxury SUV, the QX80 does not match the Patrol's off-road capability. Though the Infiniti's 4WD system is not necessarily inadequate, the Patrol stands a bit taller, loses the QX80's standard step running boards, and packs an off-road suspension. Yet both vehicles are noted for their uncommonly good ride and handling on pavement. Hustling the Q80’s 3-ton bulk along the road is a 400-hp 5.6-liter V8 powerplant that mates with a 7-speed shiftable automatic transmission to pound down 413 lb-ft of torque. This potent engine allows the QX80 to boast a max towing capacity of 8,500 pounds--top of its class--while mileage estimates come in at 14 mpg city/20 highway/16 combined with RWD and 13/19/15 with 4WD. One test track saw the QX80 sprint from 0-60 in 6.5 seconds, pretty fast for a full-size sport ute. And a set of 14-inch antilock brakes brought a QX80 with the available 22-inch wheels to a dead stop from 60 mph in an incredible 113 feet. Expect the 2017 QX80 to tote an available Hydraulic Body Motion Control feature that’s intended to lessen body roll in corners and smooth out rough roads; but be advised that this system is seriously countered by the 22-inch wheels required when ordering it. Premium standard features for the QX80’s exterior include chrome styling, alloy wheels, a trailer hitch and wiring, a power sunroof, a heated power-adjustable steering wheel, and a 360-degree around-view camera setup, as well as a trailer hitch and wiring. Inside, there's plenty of room in the first and second rows of seats, but the third row can become cramped for average-size adults. The standard second-row captain’s chairs (7-passenger seating) are comfy enough, though there are those who prefer the optional bucket seats. Still others go for an available 60/40 split-folding second-row bench seat that lets the QX80 fit 8 people more or less comfortably. A 13-speaker Bose audio system and superb soundproofing ensure a more enjoyable ride regardless of how many passengers there are. The QX80 includes the Infiniti Connection infotainment and telematics suite, though the Apple CarPlay and Android Auto smartphone interfaces are notably absent. Virtually all the world’s major automakers are placing these Bluetooth-driven systems into higher-level trims as quickly as possible, but Infiniti, at least for the present, does not appear to be following suit. Nissan, however, does offer Apple CarPlay on its 2017 Maxima, so hopefully change is on the way. Aside from the usual federally mandated safety equipment, the QX80 offers standard front fog/driving lights, turn-signal-integrated mirrors, and Nissan Connection emergency telematics, with max speed warnings, stolen vehicle recovery, collision notification, and a vehicle alarm notification. Optional safety equipment includes forward and backward collision warning and mitigation braking, forward pedestrian detection, adaptive cruise control, and a steering-wheel-mounted switch to activate the Infiniti’s Safety Shield technologies (the around-view camera system, collision-mitigation braking, and blind-spot warnings and intervention). Going head to head with its main rival, the Cadillac Escalade, the 2017 QX80 does offer a few features that the Escalade lacks, like higher towing capacity, the around-view camera system, and Infiniti’s Connection infotainment and telematics, which traditionally outshines the GM’s OnStar technology. And the Infiniti dealer experience is generally known to top that of Cadillac. 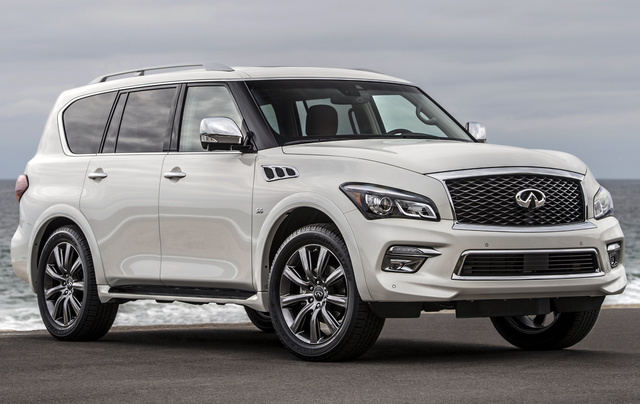 What's your take on the 2017 INFINITI QX80? Have you driven a 2017 INFINITI QX80? I recently listed my 2017 QX 80 but cannot find it on your site. How can I locate it? My QX80 does not have a clear title but I have a buyer. Can CarGurus handle his payment, payoff the balance on the vehicle, then send me the difference.